Our research is based on a methodology involving the conversion of molecular species to an inorganic nanostructures and films through appropriate processes. Therefore, we synthesize these reactive molecules, such as metal alkoxides and metal amides, by Schlenk techniques and characterise them via several appropriate analysis methods (NMR, MS, IR, XRD…). Gas phase approaches require an appropriate partial pressure of the precursors. For these approaches, the degree of oligomerisation should be low which is tailored by using donor-functionalised alcohols to achieve appropriate volatility. Solution-based processes do not suffer from such restrictions. Therefore a larger number of precursor species can be used due to the simpler requirements such as solubility and decomposition characteristics. All metalorganic compounds used in the nanomaterial synthesis are prepared in our laboratory. Metal alkoxides [M(OR)x]y are suitable precursors for oxide synthesis. An additional functionality is incorporated byintroducing thioether functionalities in the organic backbone of the alcohols for the metal alkoxide synthesis. Steric demand and the possibility of the weakly coordinating thioether functionality allowed us to prepare monomeric group 13 alkoxides and several other derivatives. These compounds allow an in situ conversion of the M-O bonds from the alkoxide in M-S moieties in the thermally derived solids. This allows us to investigate new paths for material synthesis. In addition, aminoalcoholate derivatives have been prepared, which are also monomeric compounds in the solid state. 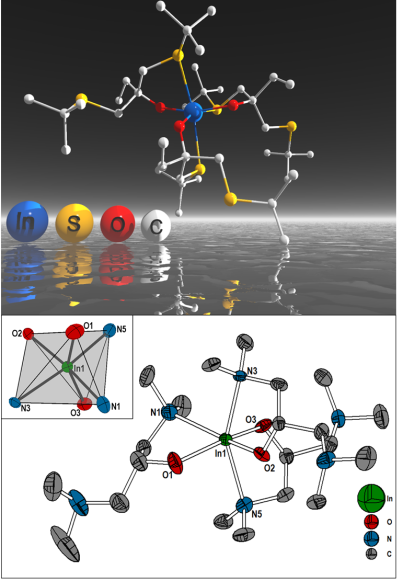 1) "Monomeric aminoalkoxides of aluminium (III), gallium (III) and indium(III)"
F. Biegger, S. Barth* Monatsh. Chem. - Chemical Monthly 2016, 147, 361-368. S. Barth*, F. Biegger, M. Puchberger Dalton Trans. 2015, 44, 16439-16445. J. Altmayer, S. Barth*, S. Mathur* RSC Advances 2013, 3, 11234-11239. A new and highly interesting topic of our research is devoted to investigating molecules which can be used in focused electron beam induced deposition (FEBID) processes. This research is highly relevant methodology , because most electron induced deposition processes lead to highly contaminated deposition products. Our involvement (WG2 Chair:S. Barth) in an European COST project CELINA resulted in new insigths. The use of heterometallic precursors resulted in an unusually high metal content in the deposits without subsequent cleaning steps. These significant results sparked additional interest of other groups and extends our network of active collaborations in this area of interest. 1) "Electron Induced Surface Reactions of HFeCo3(CO)12, a Bimetallic Precursor for Focused Electron Beam Induced Deposition (FEBID)"
R. K. T P, I. Unlu, S. Barth, O. Ingólfsson, D. H. Fairbrother* J. Phys. Chem. C 2018, 122, 2648–2660. 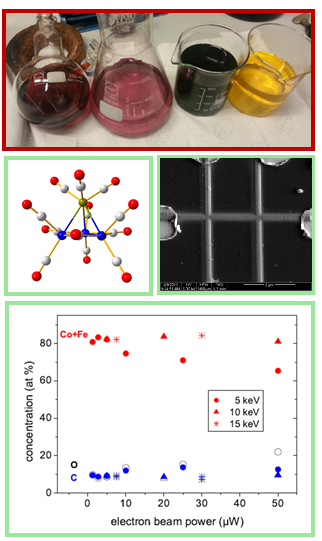 2) "Electron Interactions with the heteronuclear carbonyl precursor (H2FeRu3(CO)13): from fundamental gas phase and surface science studies to focused electron beam induced deposition "
R. K. T P, P. Weirich, L. Hrachowina, M. Hanefeld, R. Bjornsson, H. R. Hrodmarsson, S. Barth, D. H. Fairbrother, M. Huth, O. Ingólfsson* Beilstein J. Nanotechnol. 2018, 9, 555-579. M. K. I. Al Mamoori, L. Keller, J. Pieper, S. Barth, R. Winkler, H. Plank, J. Mueller, M. Huth* Materials 2018, 11, 289. 4) "Formation and decay of negative ion states up to 11 eV above the ionization energy of the nanofabrication precursor HFeCo3(CO)12"
F. K. T. R. , R. Bjornsson, S. Barth, O. Ingolfsson* Chem. Sci. 2017, 8, 5949-5952. 5) "Structure and energetics in dissociative electron attachment to HFeCo3(CO)12"
K. T. R. Kumar, S. Barth, R. Bjornsson, O. Ingolfsson* Eur. Phys. J. D , 2016, 70, 163. F. Porrati*, M. Pohlit, J. Müller, S. Barth, F. Biegger, C. Gspan, H. Plank, M. Huth Nanotechnology 2015, 26, 475701. Metal amides and imides are important compounds for the synthesis of metallic nanostructures and metalloids. 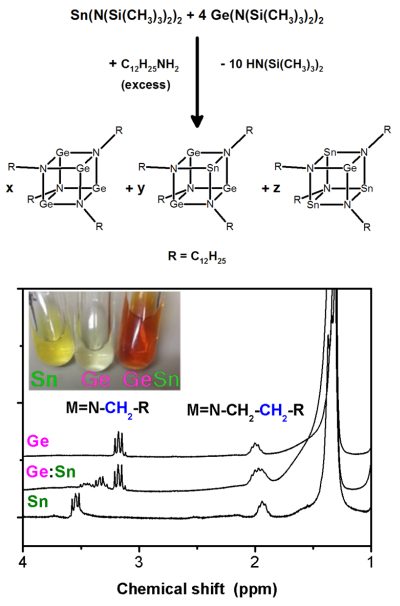 For instance, the formation of mixed metallic imido cubanes allowed us to synthesize the first bottom-up derived germanium-tin nanowires with a high tin content. The metal silylamides used are converted in the imdo cubane species by ligand exchange. Their formation can be easily followed by NMR spectroscopy and allowed us to get deeper insight in the formation mechanism of Ge nanostructures and Ge/Sn alloys from molecular sources in solution based processes. M. S. Seifner, F. Biegger, A. Lugstein, J. Bernardi, S. Barth* Chem. Mater. 2015, 27, 6125-6130.